So You Paid for Booth Space - Now You Have to Fill it. You’ve committed to a booth at PACK EXPO and now you have to fill it. How many pieces of equipment can you fit into the booth? Will you be able to exhibit “1 of each” piece of equipment that you sell? How many meeting areas do you need? Are you going to have room for your 100’ video wall? How about a double deck? These are all legitimate questions (although maybe the 100’ video wall doesn’t apply to many of you). If you are uncertain of all the show rules and regulations, mainly sightline restrictions, height limits and hanging sign stipulations, your exhibiting experience can cause a lot of stress. You’ll want to download the rules & regs here. It’s an easy read, only 16 pages, but has all the pertinent info on what you can and cannot do at the show. Here, we’ll explore some of the important rules and regs you should be aware of. 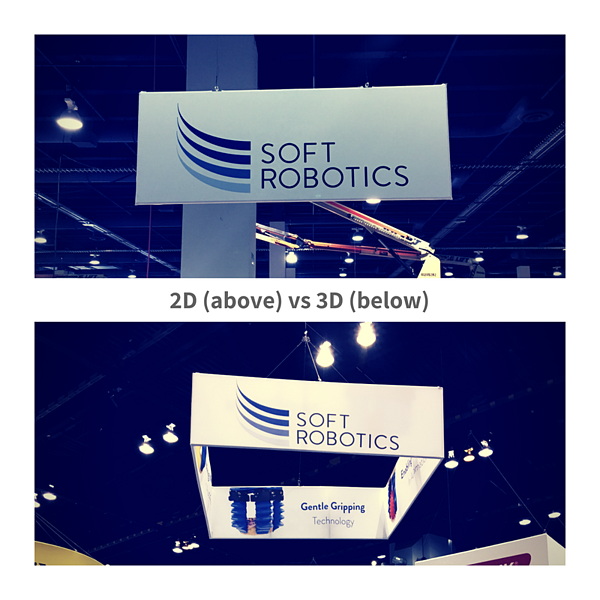 Depending on your booth type (there are technically six of them), you might have to adhere to certain sightline restrictions in your booth space. This basically means that there are certain areas within your booth where you are not allowed to have anything taller than 4’ in height. These areas are usually typically at the ‘front corners’ of your booth where you have an adjoining exhibit. This restriction is put into place to allow attendees to have a fair view of your neighbor’s exhibit as they walk down an aisle. The square footage of your booth will dictate how high all of your graphics can go. Graphics would include any wall structures or hanging signs. How high your walls/graphics/hanging sign can go can mean the difference of your messaging being seen from a longer distance or not. 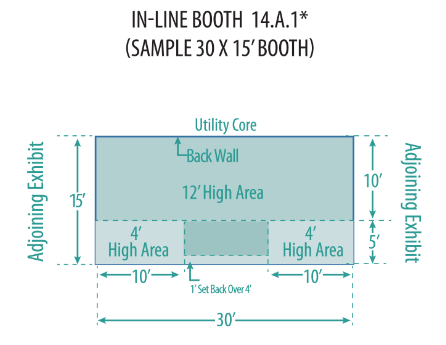 Booth height limits are typically 12’ or 18’ for PACK EXPO - but they are changing. Another consideration here is how high your neighbors (sides and back) can go. If you are only allowed to go up to 12’ and your neighbor can go up to 18’, you could possibly see 6’ of the back of their wall above yours. 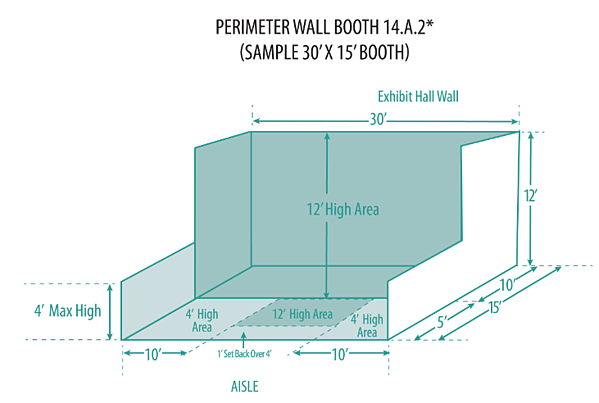 While they would have to make sure the wall is ‘clean’ facing into your booth, it can cause distraction and take away from your exhibit/message. As for hanging signs, let’s say that your height limit is 12’, which means the top of your hanging sign cannot be any higher than 12’ off the ground. Then comes the question of the height (dimension) your sign should be. If you went with a 4’ height dimension, that means the bottom of the sign is 8’ off the ground. Will it be too close to your machines? Will it give your booth a crowded feel? Will that 7’ tall guy in your booth be able to touch it? How’s your headache now? IMPORTANT PSA - If you’re exhibiting at PELV 2019, make sure you check the NEW rules for height limits. Some booths will no longer be allowed to having hanging signs - it’s all based on square footage. Download the new rules and regs. Did you check the rules before you selected your booth space last month? These are great ways to draw visitors to your booth from a distance. We just covered some of the vertical issues with these, what about horizontal distance? You typically cannot have sign graphics that are within 10’ of neighboring booths. Depending on how the machines fit within your space, your height limit and how close your neighbors are, you could do a flat (2D) hanging sign vs a 3D hanging sign. Maybe you can turn your square sign on a 45 degree angle and fit within the rules. Maybe you have to do with that 2D version to gain extra distance. Before purchasing a new sign or using an existing one, I always recommend you check with show management FIRST to make sure your sign adheres to the rules. Each show is different. Your CAM can help you with these questions. Or, here is a link to all PACK EXPO contacts. Now, I might have just increased your anxiety about exhibiting, but if you have a good strategy in place for selecting a booth and stay up to speed on the rules and regs, it’s not as bad as you think. Since you pick our booth so far in advance, you’ll want to figure out your strategy on what makes sense for YOUR company. Each company has different goals and objectives at shows. Figure out the right combination (booth type, size, orientation, height limit, location, etc) that works best for you and run with it.